Those of you who know me know my old southern “boyfriend” Darryl and his fabulous ribs and cheesecake recipes – the only two things that lasted from that relationship 20 years ago! This cheesecake is by far the most decadent I’ve ever made – 12 of these cakes graced Kevin & Roses wedding and more recently the other Kevin’s 40th b-day party! The reason behind the decadence this time was none other than Niki – a 25 year old sweetheart, from Belgium, that has NEVER EATEN cheesecake in her life. A syndrome that needed fixing immediately! I gladly obliged remedying the situation! You are welcome to serve this with a fresh fruit something or other, but please do me a favor and eat your first bite plain! Mix to combine and line the base, and walls of a 9″ spring form pan. If it’s not sticking enough for you – add more melted butter. If you don’t have enough to cover the edges of your pan, mix in more graham crackers. Bang the bowl on the counter top a couple of times to get the air bubbles to move to the top. Cover and let batter sit in fridge OVER NIGHT to remove air. Pour into crust. Bake at 200°F – 225°F (93°C – 107°C) NO HOTTER or it will turn out grainy! for 3-4 hours. In comments below: Cjones and I both baked ours for four hours in a regular oven, then turned it off and left the cake in the oven until it cooled. Worked perfectly for both of us! It’s finished when a knife or toothpick inserted into center of cake comes out clean. Optional to add a pan of water in the oven. A convection oven takes considerably less time to bake. Let cool completely then top with a Sour Cream and Honey mixture. This is entirely optional – Mine was pretty runny because I never wrote that part of the recipe down – I never thought it added a whole lot to the cake. 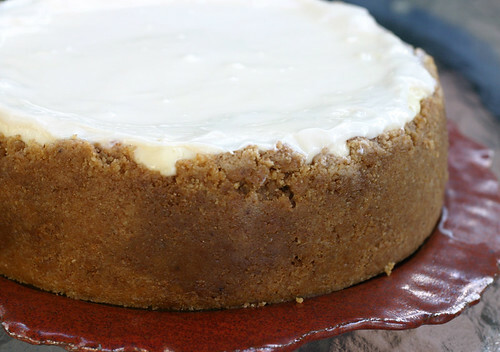 In comments below: Add the sour cream mixture (sour cream with a little honey or sugar) during the last 40 minutes of baking so it can cling to the cake, once it’s been cooled and refrigerated the topping will stiffen considerably. This worked perfectly and it turned out great, for me, when I tried it! ← Zucchini Cakes without Oil! This looks worth every minute on the elliptical! Great cheesecake. Your recipe rocks! Looks really good. Wish I could have some. The texture of the cake looks really nice. I like this type of texture; not grainy a block or too smooth, so it has some teeth. Good idea on the pecans.. it’s pecan season down here so thanks for the idea. OMG! that is just one delicious-looking cheesecake!!! That looks amazing! I love the addition of the pecans,too. Wow…This is the most beautiful cheesecake I have EVER seen…I made a triple Vanilla Cheesecake..but this is UNBELIVABLE. WOw, 3-4 hrs?! Very interesting. I guess it’s worth the wait, look how creamy it is! Can you tell me what 3# cream cheese means? The # sign means pounds. That is a fine lookin’ cheesecake! that doesn’t translate well ….. when an angel pee’s on your toungue – you got nothin’ but URINE! Let me say this, it tastes like heaven! I’ll have to introduce Belgium to this delicious cake! I keep clicking on photos from another site, and they all lead to your blog! I guess I’m going to have to start following you. Welcome! and enjoy the ride. My favorite recipe is almost exactly the same. I use a sour cream/granulated sugar/vanilla mix to top it. I pour it on for the last 5 minutes of baking which sets it firm after chilling. It’s pure cheesecake perfection! Made this cheesecake for the second time since Thanksgiving. My family loved it. Very rich and yummy!! FYI – I baked the cheesecake at 225 degrees for 4 hours and then turned the oven off until the cake had cooled. Great minds! I did the EXACT same thing, (except I only made it once) because it was the first time I didn’t make it in a convection oven. I’ll add it to the directions right now. So glad you liked it and thank you for letting me know! FYI – here is what I did for the topping. 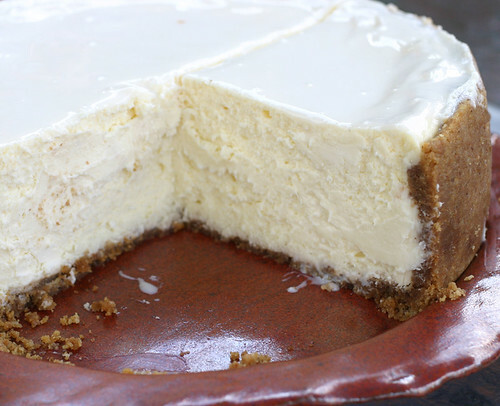 Cover the top of the cheesecake and bake for 8 to 10 minutes. The sour cream topping congeals when the cake cools. Cool outside oven. No, I have not. I’m sure they would turn out fine with less time. Test a batch, and you’ll know for sure! Is there any graham crust on the bottom or is it just on the sides? 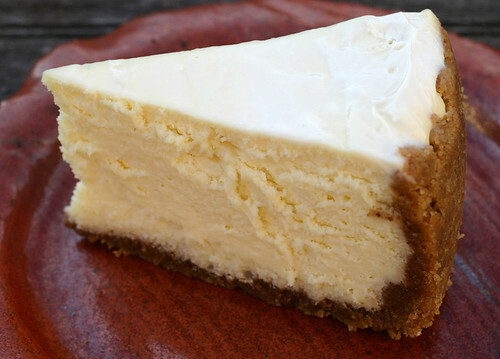 Just like all cheesecake – sides and bottom.